After learning on Sunday that while Honda has subsidized lease deals on the base model CR-V LX, those lease terms can’t be applied to other, higher priced CR-V trims, I made a trip to another car dealer, to check out a car that should’ve been on our list, but sorta kinda wasn’t: the Mazda CX-5. The CX-5 Touring offers all of these things, except for Android Auto. Mazda supposedly will retrofit it to their existing cars at some point, and there’s been some talk outside the US about doing it across their lineup, but so far in the US it’s only been announced for the 2018 6. The mirror can be had either as a dealer accessory for $325, or part of the $1200 preferred package which also includes navigation, Bose stereo, sunroof, and power tailgate. I think the package is worth it. When we got home from the Honda dealer, my wife had to head out to do some work stuff, and I was planning to go to the gym. But right next to the shopping center where my gym is, there are Chevy, VW and Mazda dealers. So I figured I’d go peek at a CX-5 real quick and find out if the subsidized lease terms could be applied to not only the base model that’s being advertised. I drove the CX-5, and, well, it’s nice. More on that in a sec. The CR-V is an extremely practical and space-efficient vehicle. There’s tons of room inside and all sorts of interesting cubbies and organizers and dividers and cup holders. It is probably the most rational 2-row crossover on the market. The interior is nicer than the average mass-market car, and most folks would be very happy with it. My wife was willing to try and lease one, and liked it, but she thought it was a little too big. It’s not big, really. But the dash and cowl are super tall, and the top of the hood kinks up towards the fenders and protrudes into your view. The height of the non-glass parts of the front of the car is substantial. Also, it’s not particularly inspiring to drive. Which is fine for most people. It’s competent, but driving it doesn’t feel quite natural. When you take a turn with a little speed, it turns in, changes direction, leans over some, then takes a set and continues through the turn. It’s capable of doing it just fine, but it’s not smooth. The CX-5 on the other hand, is much less rational than the CR-V. While its exterior dimensions are within an inch or two of the CR-V, there’s just less room inside. The interior is high quality, but console around the shifter doesn’t offer much knee room if you splay your knees out sideways some. When I adjust the driver’s seat for my 5'11" self, I can fit in the back fine, but there’s less leg room than the CR-V. The trunk is reasonably large, but again, smaller than the CR-V. There are less handy nooks and cubbies and dividers. It’s actually pretty decent to drive. Both cars have smooth, quiet rides, but the CX-5 feels much more fluid in turns. Unlike the CR-V, there’s no turn-lean-bite dance. It just...turns. The brakes are much less grabby, requiring more pedal pressure. Its normally-aspirated 2.5 liter motor feels more responsive to throttle inputs than the CR-V’s 1.5 liter turbo. At least you get something in return for the lower mileage. The cowl height is lower than the CR-V and there’s no sticky-up fenders in your view. I thought my wife would like it enough that I asked for some preliminary lease numbers, just to see if it would be in the ballpark of what we want to pay. The numbers sounded good. I told them I’d bring my wife back. Then she texted me that her work stuff finished early, and I asked if she wanted to come check out the CX-5. She stopped in, took it for a drive, and liked it a lot more than the CR-V.
We weren’t quite ready to pull the trigger on Sunday, because my wife couldn’t make up her mind on color. 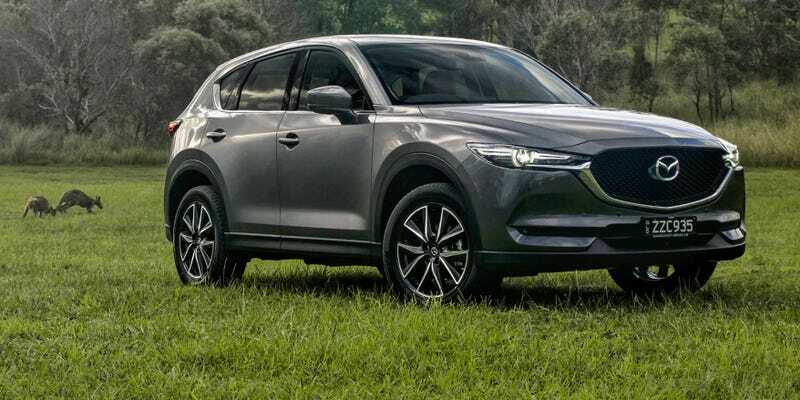 We wanted a CX-5 Touring AWD with the lighter, “silk beige” upholstery, the preferred package, and she was trying to decide between the gunmetal grey or navy blue that interior can be combined with. They had a blue one on the lot, but not grey. You might be thinking to yourself, hey, that looks like leather that my wife wants to avoid, but Mazda specifies that the Touring has leatherette and ultrasuede upholstery. This is acceptable. Once we got home and she had some time to think about it, she decided she wanted grey. I did some searching online and this same dealer group has another Mazda store about 23 miles from us, instead of the one that’s a mile down the street from us, and they had a grey/beige one in stock. I called our sales guy yesterday, and he suggested putting a deposit on the car so they could swap it from the other location. I stopped in on my way over to the gym last night, and the sales manager couldn’t get a hold of his counterpart at the other location, so he said not to worry about the deposit, they would get us the car, and then we can come in and work out the deal. We’re probably going to do that tomorrow night. Because tonight is leg day. Yes, my wife is willing to wait another day for her new CX-5 so I can avoid skipping leg day.